1. To renounce formally, which is commonly done by a monarch of a throne; to vacate a throne, to relinquish, to abandon: Edward VIII of England abdicated the throne so he could marry a commoner whom he loved. A king can abdicate, renounce, or swear away his kingly privileges and duties. 2. To refuse to accept an obligation or responsibility: When Sharon was told to revise her book, as instructed by her editor, she suddenly abdicated her contract with the publisher because she didn't agree with the new format. 3. To proclaim or declare to be no longer one's own, to disclaim, disown, cast off; especially, to disown or disinherit children: Gary Brown abdicated his responsibilities as a husband and father and never returned to be with his wife and children. 4. To give up (a right, trust, office, or dignity); to leave, to lay down, to surrender, to abandon; at first implying voluntary renunciation, but now including the idea of abandonment by default: Governments, both national and local, seem to be abdicating their responsibilities to provide a good education for all of their citizens by greatly reducing the financial expenditures that are needed. Tom abdicated his responsibilities as a salesman and left town to look for another place to live. 5. To leave one's position, office, or power: Yielding to the pressure of public opinion, the president of the country is abdicating his political authority. The outraged citizens forced the talk-show host to abdicate his radio program. 6. 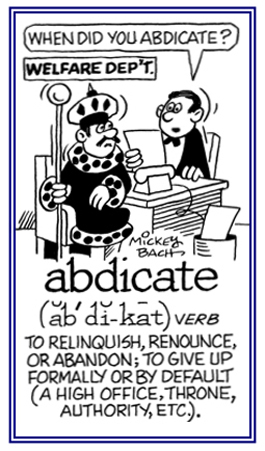 Etymology: from Latin ab-, "away" + dicare, "to proclaim". When people abdicate their positions, they "proclaim away" their authorities. A descriptive term for a person who has given up a right, a trust, or an office; either voluntarily or under pressure: The abdicate congressman resigned his position after his party urged him to leave when he finally admitted presenting himself inappropriately on an internet social-networking site.